President Donald Trump’s decision to reinstate the ban on transgender Americans from serving in the military is a deplorable, shameful assault on the military and LGBTQ communities. More than 15,500 transgender people are now serving bravely and honorably in the military, thanks to a 2016 decision by the Obama administration to lift the ban on open trans service. That decision brought the military’s formerly outdated medical regulations into line with the consensus of the medical and scientific communities, which is that all able-bodied and fully qualified Americans are fit to serve, regardless of gender identity. The U.S. military is the largest employer of transgender people in the country, and trans Americans serve in the military at rates far higher than the general population. Their service should be honored and respected, but instead, Donald Trump chose today to attack and smear these brave soldiers and their families. This is outrageous – transgender people show more courage just by living day-to-day as their authentic selves than Mr. Trump ever has in his life. The President’s stated rationales for reinstating the ban – that transgender military service is too costly and disruptive – are lies. The experiences of eighteen other countries, including many with highly effective militaries like Australia, Canada, Israel, and the United Kingdom, show that transgender people can serve in the military with no impact on unit cohesion, morale, and readiness. And the RAND Corporation estimates that providing medical care for transgender troops costs, at most, $8.4 million – a little over one-hundredth of one percent of the military’s total annual healthcare budget. To put that number in context, the military spends five times that amount on Viagra alone. This isn’t about military effectiveness, this is about bigotry – and if there’s one thing the LGBTQ community knows how to do, it’s how to stand up to bigotry. We know how to fight, we know how to win, and we’ve been doing it for a long time against far greater odds. We will overturn this cruel and discriminatory policy reinstatement, and the judgment of history will be rightfully harsh on Donald Trump and the bigoted administration that announced it today. 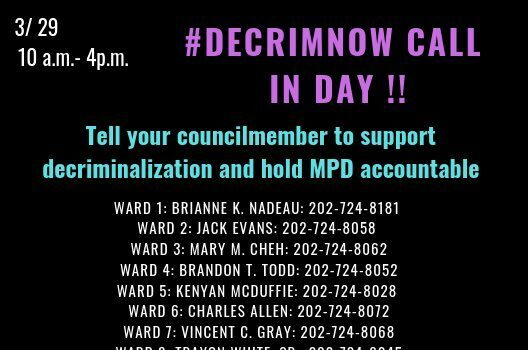 March 29 Is #DecrimNow Call-in Day! Founded in 1971, GLAA is an all-volunteer, non-partisan, non-profit political organization that defends the civil rights of lesbian, gay, bisexual and transgender people in the Nation's Capital. GLAA lobbies the D.C. Council; monitors government agencies; educates and rates local candidates; and works in coalitions to defend the safety, health and equal rights of LGBT families. GLAA remains the nation's oldest continuously active gay and lesbian civil rights organization.